TNG Models has a vast selection of models, talent and actors for tradeshows, photo shoots and special events. TNG needed a custom software system and website that would allow their clients to select desired models and cast them for events. With integrated online payment processing, powerful admin backend for reviewing castings, creating bookings, invoices and finally allowing clients to pay online. The slick software interface is simple to use and allows models to signup, create their own profiles, & upload videos and images. Powerful search makes it easy for clients to find the exact model they are looking for quickly. 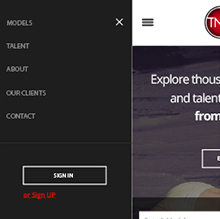 Also custom alert system allows models/talent to quickly accept or decline castings right from there mobile device. Simple user experience allows clients to quickly add models to castings or favorite models with one click. Models can update profile photos and videos. Custom photo editing software allows Admins to crop pictures with ease. Online payment processing and invoice management gives TNG clients easy access to pay online and book models or talent quickly. Responsive design renders beautifully like TNG across all devices.